Frank Ferrante has been a NYC cab driver, a scrap metal hauler, a dishwasher, a census taker, a mail boy, a ditch digger, a bouncer, a drug pusher, a contractor, an actor, a radio announcer and a carpenter. He has also been an avid reader, a seeker of God, an alcoholic, a junkie, a speed freak, a vegan, a lover, a loser, a hater, a husband, a father, a grad student, a good guy and a bad guy and a social activist. He has been overweight a well and here is his story of how he moves from obesity to an inspirational guru in just 42 days. He had three young coaches to help him lose weight and get past his issues. After contracting hepatitis C, Frank walks into Café Gratitude where the staff takes him under their wing. Cary Mosier, Ryland Engelhart and Conor Gaffney put him on the path to enlightenment. The three coached him and Frank began a journey that was to change his life forever—physically, emotionally and spiritually. The first thing that Frank had to do was to deal with the issues that were responsible for driving him to the bad habits that he developed—his divorce, problems with his siblings and the lack of a relationship with his daughter. As he went through his transformation, he lost 110 pounds. There are other people like Frank around with no idea of where to go to turn their lives around so the film becomes a manual for them. Café Gratitude is a vegan restaurant that prides itself on helping others and gives the world what the owners call “Sacred Commerce”. It is heartwarming to see the love and care they provide to people who are down and out. 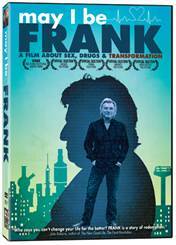 With Frank, drugs and drinks had taken their toll and even now when he is clean and sober, he still needs help. He was guided through a program of healthy vegan meals, exercise, affirmations, checkups and different therapies for his body. Frank promised to keep a log of his journey so that he could always look back and remember how bad it had once been. He was taught to repeat the following mantra: “I, Frank, do love me. I am a perfect human being, radiant beauty and divine energy. I am Divine. I now hold in my mind this new image of myself as a thriving, flourishing, gloriously beautiful human being.” Even after several unsuccessful attempts to get straight, Frank realized that he had hurt many people. We watch him at sessions, during his stumbles and his falls and as he loses weight and succeeds. It took him a while to realize that he had to love himself and when he learned that he was able to not only reunite with his daughter but to start taking graduate courses. We cannot help but love him and cheer him on. This is the perfect movie if you need inspiration or even if you just want to see a well-made documentary. This entry was posted in Film on February 25, 2013 by Amos.